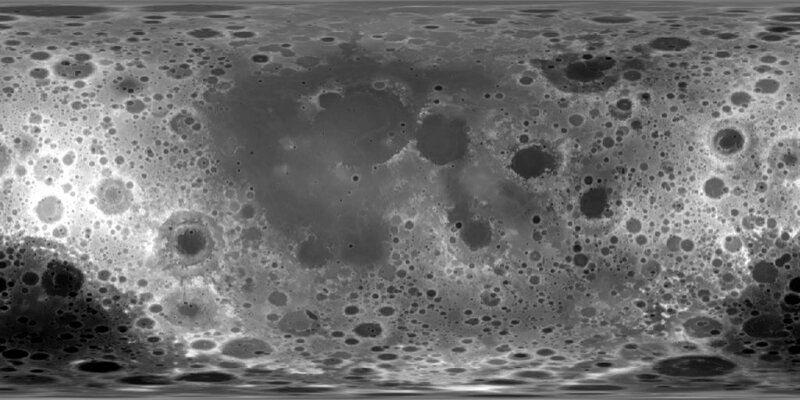 This digital elevation model (DEM) is based on data from the Lunar Orbiter Laser Altimeter (LOLA; Smith and others, 2010), an instrument on NASA’s Lunar Reconnaissance Orbiter (LRO) spacecraft (Tooley and others, 2010). The created DEM represents more than 6.5 billion measurements gathered between July 2009 and July 2013, adjusted for consistency in the coordinate system described below, and then converted to lunar radii (Mazarico and others, 2012). Elevations were computed by subtracting the lunar reference radius of 1737.4 km (Archinal and others, 2011; LRO Project and LGCWG, 2008) from the surface radius measurements. Thus elevation values are the distance above or below the reference sphere. The average accuracy of each point after crossover correction is better than 20 meters in horizontal position and ~1 meter in radius (Mazarico and others, 2012). The measurements were converted into a digital elevation model (DEM; Neumann and others, 2010) using Generic Mapping Tools software (Wessel and Smith, 1998), with a resolution of 256 pixels per degree. In projection, the pixels are 118 meters in size at the equator. Gaps between tracks of 1–2 km are common, and some gaps of up to 4 km occur near the equator. DEM points located in these gaps in LOLA data were filled by interpolation (Smith and others, 2011). * Archinal, B.A. (Chair), A’Hearn, M.F., Bowell, E., Conrad, A., Consolmagno, G.J., Courtin, R., Fukushima, T., Hestroffer, D., Hilton, J.L., Krasinsky, G.A., Neumann, G.A., Oberst, J., Seidelmann, P.K., Stooke, P., Tholen, D.J., Thomas, P.C. and Williams, I.P. (2011), Report of the IAU Working Group on cartographic coordinates and rotational elements: 2009, Celestial Mechanics and Dynamical Astronomy, 109, no. 2, February, pp. 101-135, doi 10.1007/s10569-010-9320-4. * Davies, M.E. and Colvin, T.R. (2000), Lunar coordinates in the regions of the Apollo landers. JGR 105(E8), pp. 20,277 - 20,280. * Folkner, W. M., Williams, J. G., and Boggs, D. H. (2008), The Planetary and Lunar Ephemeris DE 421. JPL Memorandum IOM 343R-08-003, 31 March. Url: ftp://ssd.jpl.nasa.gov/pub/eph/planets/ioms/de421.iom.v1.pdf. * Folkner, W. M., Williams, J. G., and Boggs, D. H. (2009): The Planetary and Lunar Ephemeris DE 421. IPN Progress Report 42-178, August 15. Url: http://ipnpr.jpl.nasa.gov/progress_report/42-178/178C.pdf. * Greeley, R. and Batson, R.M. (1990), Planetary mapping: Cambridge University Press, pp. 274–275. * LRO Project and LGCWG (2008), A standardized lunar coordinate system for the Lunar Reconnaissance Orbiter and lunar datasets, LRO Project and LGCWG White Paper, version 5 of October 1, Url: http://lunar.gsfc.nasa.gov/library/LunCoordWhitePaper-10-08.pdf. * Mazarico, E., Rowlands, D.D., Neumann, G.A., Smith, D.E., Torrence, M.H., Lemoine, F.G. and Zuber, M.T. (2012). Orbit determination of the Lunar Reconnaissance Orbiter, Journal of Geodesy, Vol. 86-3, pp. 193-207. * Smith, D.E., Zuber, M.T., Neumann, G.A., Lemoine, F.G., Mazarico, E., Torrence, M.H., McGarry, J.F., Rowlands, D.D., Head, J.W., III, Duxbury, T.H., Aharonson, O., Lucey, P.G., Robinson, M.S., Barnouin, O.S., Cavanaugh, J.F., Sun, X., Liiva, P., Mao, D., Smith, J.C. and Bartels, A.E. (2010), Initial observations from the Lunar Orbiter Laser Altimeter (LOLA), Geophysical Research Letters, 37, L18204, doi:10.1029/2010GL043751. * Smith, D.E., Zuber, M.T., Neumann, G.A., Mazarico, E., Head, J.W., III, Torrence, M.H. and the LOLA Science Team (2011), Results from the Lunar Orbiter Laser Altimeter (LOLA): global, high-resolution topographic mapping of the Moon, Lunar Planetary Science Conference XLII, Abstract 2350. * Tooley, C.R., Houghton, M.B., Saylor, R.S., Peddie, C., Everett, D.F., Baker, C.L. and Safdie, K.N. (2010), Lunar Reconnaissance Orbiter mission and spacecraft design, Space Sci. Rev., 150, pp. 23–62, doi:10.1007/s11214-009-9624-4. * Wessel, P. and Smith, W.H.F., 1998, New, improved version of Generic Mapping Tools released: Eos, Transactions of the American Geophysical Union, v. 79, no. 47, p. 579. * Williams, J. G., Boggs, D. H., and Folkner, W. M. (2008), DE421 Lunar Orbit, Physical Librations, and Surface Coordinates. JPL Interoffice Memorandum IOM 335-JW,DB,WF-20080314-001, 14 March. Url: ftp://ssd.jpl.nasa.gov/pub/eph/planets/ioms/de421_moon_coord_iom.pdf. To create a preliminary elevation model for the Moon. The LOLA data were initially referenced to an internally consistent inertial coordinate system, derived from tracking of the LRO spacecraft. By adopting appropriate values for the orientation of the Moon as defined by the International Astronomical Union (IAU, Archinal and others, 2011), these inertial coordinates were converted into the planet-fixed coordinates (longitude and latitude) used on this map. The coordinate system defined for this product is the mean Earth/polar axis (ME) system. The ME system, sometimes called the mean Earth/rotation axis system, is the method most often used for cartographic products of the past (Davies and Colvin, 2000). Values for the orientation of the Moon were derived from the JPL DE/LE 421 planetary ephemeris (Williams and others, 2008; Folkner and others, 2008, 2009), rotated into the ME system. Longitude increases to the east and latitude is planetocentric as allowed in accordance with current international and NASA standards (Archinal and others, 2011; LRO Project and LGCWG, 2008). The intersection of the lunar equator and prime meridian occurs at what can be called the Moon’s “mean sub-Earth point.” The concept of a lunar “sub-Earth point” derives from the fact that the Moon’s rotation is tidally locked to the Earth. The actual sub-Earth point on the Moon varies slightly due to orbital eccentricity, inclination, and other factors, so a “mean sub-Earth point” is used to define the point on the lunar surface where longitude equals 0°. This point does not coincide with any prominent crater or other lunar surface feature (Archinal and others, 2011; LRO Project and LGCWG, 2008). Gaps between tracks of 1–2 km are common, and some gaps of up to 4 km occur near the equator. DEM points located in these gaps in LOLA data were filled by interpolation (Smith and others, 2011). The high and low elevations in the DEM are approximate because of the interpolation process uesd. Elevations were originally computed by subtracting the lunar reference radius of 1737400.0 m (Archinal and others, 2011; LRO Project and LGCWG, 2008) from the surface radius measurements. Thus elevation values are the distance above or below the reference sphere.